I feel like saying: does anyone else actually know or remember this group? Sometimes it seems they were only a thing I dreamt: an unattainable vision (and sound) of doo wop perfection, never seen by waking eyes or heard with unclogged ears (I'll explain later). And yet there they are, a glimpse of them, anyway, on youtube; CDs can be bought; there's an official website which hasn't yet been taken down, even though I believe they called it a day in 2003. They're even mentioned briefly in Jay Warner's Billboard book of vocal groups. Perhaps it's simply the oddness of the situation: an accomplished act, who I saw time after time slaying live audiences, never made it truly big in America or the UK, only attaining the scale of recognition they deserved in Japan. Whatever the reason, I want to commemorate 14 Karat Soul. They should be revered all round the world. I first came across them in 1981 at the Edinburgh Festival, an annual celebration of the arts in Scotland's capital. The beauty is that anyone can perform at the so-called Festival Fringe, which over time has become much bigger than the festival itself. Studying Greek tragedy at university in nearby Glasgow, I was intrigued by the idea of a production of Sophocles' Oedipus at Colonus with Gospel music. I can't remember if the word "doo wop" was mentioned in the Fringe brochure (each act is given two or three lines to sell itself to potential audiences) but what I got for my gamble in the staid setting of the Assembly Rooms that evening in Edinburgh was what seemed to me doo wop heaven. As well as The Gospel at Colonus, as the Sophocles adaptation was called, there was a piece called Sister Suzie Cinema which was all about atmosphere rather than plot (five young men enter a cinema, are beguiled by visions of fifties starlets, then leave). The university student in me ought to have dismissed this as the slighter piece; the burgeoning doo wop fan, however, was only aware of the most gorgeous, soaring harmonies, unimpeded by any instrumentation (The Gospel... had a piano), and a growing sense of entering a trancelike state which was partly the production's intended effect - the characters were in a place which peddled dreams - and partly because I had never imagined that the essence of those scratchy fifties recordings could be brought so vividly to life. And as this is a blog, I don't have to omit the indelicate detail that I was having ear trouble at the time which meant that I had to pull down sharply on one lobe in order to hear anything which didn't sound as though multiple layers of cotton wool had been interposed between me and the sound source. So there I am, soaring in doo wop heaven, drinking in all this acapella perfection, taken to heights of aural ecstacy such as I have never known before ... and all the while head to one side, forever tugging on that lobe. Fate can be cruel and kind. I'll spare you the details of the subsequent syringing, except to add that as sounds - wonderful bright, clear three-dimensional sounds - poured into my head once again, I could only mutter to the nurse: "Too late." 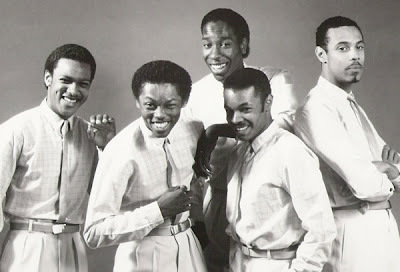 Living in the UK with no internet in those days, I had no easy means of finding out afterwards about the group's career in America, though I do remember thinking: "Hey, don't they realise they could use that singing ability to perform actual doo wop oldies? Now that I would pay to go and see." 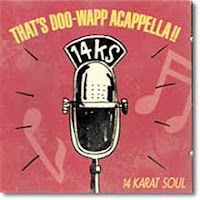 It never occured to me that Lee Breuer, creator of the two pieces, had chosen 14 Karat Soul precisely because, young as they were, they already had a reputation as ace doo wop revivalists, championed by Stan Krause and others. My chronology is now a little vague, but around a year later I was delighted to find that the group, who had toured The Gospel at Colonus and Sister Susy Cinema around Europe, were having a week long residency in the unlikely spot of the Mitchell Theatre in Glasgow. I say unlikely because although Glasgow audiences are known for their warmth - Green's Playhouse, later the Apollo, was a renowned UK venue for rock acts - the small Mitchell Theatre was part of a recent extension to Glasgow's main reference library, so it had no history or particular atmosphere, although very pleasant. Possibly it was cheap, or possibly it was a handy place to try things out away from the glare of too much publicity. Maybe it had state of the art sound, as that was certainly very good. The visit may also have coincided with Mayfest, Glasgow's modest attempt to start a festival of its own to rival Edinburgh's, as I remember 14 Karat Soul performing as part of that festival around the same time. Anyway, I booked to go to the Mitchell Theatre, normally home to local amateur theatre groups, just about every night of their stay. I saw them quite a few times afterwards but that week at the Mitchell Theatre is how I remember them. Aspects of the act changed from night to night, suggesting that it may have been a tryout base, although these were fairly minor. Essentially, they were good to go from the first night - and the first number - onwards. I'm now going to try to remember as many of the songs featured in that week as I can. Quite a number are available on CD, although I cannot stress enough what a long way those antiseptic studio recordings are from hearing (and seeing) five figures with nowhere to hide blasting out at you. I think this is what draws me to acapella doo wop, and acapella in general: the knowledge that you're watching a balancing act, and if there is one weak link in the troupe they will all topple. You're seeing something vulnerable and human. Come the twentieth century, however, the advent of mass production and the development of new, artificial materials meant people were surrounded by objects which they didn't really understand and so they lost a secure sense of their place in the world which led to social alienation and lots of depressing - I mean, challenging - literature. The tutor probably put it better (it was over twenty five years ago) but when I see an acapella group onstage, vulnerable in way that no overamplified rock band can be, all I know is that I feel in touch with something fundamental. There's sense of intimacy involved: the directness of the human voice, rather than a lump of metal in front of the face, to provide the music; the self-exposure and risk in the sharing of that voice, in offering it to others for judgement. Then the magical-seeming, yet utterly human, way in which a group of people can temporarily subdue their egos to create a single entity. To go back to the image of the balancing act: when nobody falls - when, in fact, they all seem to soar - then that is a joyous moment which affirms your faith in humanity. And as the listener, you feel like an intimate part of that group. As part of my job I've had to do some research into folk music in Britain. I'd always known about the fifties folk revival in America and Britain but didn't realise that all through the twentieth century and earlier collectors had been trying to preserve what they could of ballads handed down through the generations. I don't know enough to discuss it in detail, though I believe part of the impulse in Britain would have been as a response to the growing dominance of imported American culture. Interestingly, however, on a visit to Cecil Sharp House (the UK's Folk Music Central), when I mentioned my interest in doo wop to the assistant librarian Peta Webb, she likened it to folk music. Which I suppose all comes back to that phrase which struck me all those years ago in the Rolling Stone Encyclopedia: "music you or your lover could have made." Back to the show, as the audience is getting impatient. The group kicked off with Boogie Woogie Bugle Boy, and it was very heaven, what with both ears now fully operational and tuned in. The bass singer had, I believe, been a drummer, and was miming a double bass; but the moment I really knew this was something special was at a particular blending of voices around "And now the company jumps when he plays reveille ..."
I can't describe precisely what was being done; I can only say it sounded grainy but right, rough but undoubtedly polished, not accidental. And a million miles away from barbershop. Or, come to that, any white doo wop group I'd heard. The nearest match I've heard on record is towards the end of the Spaniels' Get Away Child (You Don't Move Me). Sadly, although you can hear Boogie Woogie Bugle Boy online (see below), it doesn't really convey what I heard on those successive nights at the Mitchell Theatre. The sheer attack of that opening number (cannily chosen from outside the genre), and the promise of an evening of joy to come, is something I'll never forget. I can't remember the order in which other songs were performed; there may have been a bit of juggling around from night to night. Operator opened the second half in a change of costume and I became aware of the old-fashioned curtain backdrop and lighting, as though this could have been any night in the fifties; Trickle, Trickle was performed near the end, as was, I think, The Morse Code of Love. But one of the highlights for me was Farewell, My Love, which I'd never heard before. I subsequently found out it's an old Temptations number which was as much doo wop as soul; on the original recording the bass voice echoes (or is echoed by) an actual bass all the way through, so really one or the other is redundant, and the song was eminently suited to an acapella rendering. I'm presuming it was a favourite of Stan Krause's, as the Royal Counts also recorded it. The full meaning ... came to me: the bass, Briz, loomed as the lead sang, one last time, of his yearnings, intoning over him those doomy notes that spelled out just one thing: You're alone, Bub; get used to it. 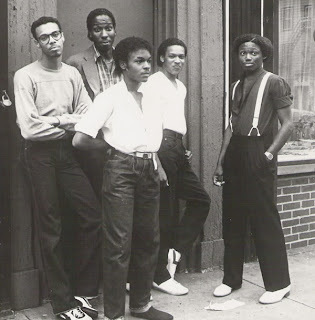 The bass was reality, just as he often takes over on "baser" group sides (Pookie for the dreams; Gerald for the down'n'dirty), and his notes here were a death knell for the lead's tattered vision of togetherness ("Maybe she'll want me... "), a bell to toll him back to his sole self, alone in the less than tender night. Briz was singing right into his face, with a sort of evil glee: maybe this message from the Reality Zone had to be given, but he was certainly enjoying the task, and the "teenage" lead was not much liking it, protesting his love and need to the end. You can read the above in its original context here. Whether it was before or after that residency, I was with some friends at the Mayfest festival and 14 Karat Soul were queueing in the communal cafe (no Edinburgh elitism in good old leftwing Glasgow). I wanted to go over and say It's great what you're doing - I love the Dells, etc - but I didn't. Fast forward a few years and I'm living in London, going to see 14 Karat Soul at the Fridge in Brixton. I'm near the front of the stage, immersed in the performance, when I find I'm one of the people called up to add a few extra dum dums to Come Go With Me. This is a task into which I throw myself with relish - only at some point one of the singers, grinning, makes a gesture. He slashes his throat with his index finger, which I know now almost certainly means "Shut the *&%! up as you cannot carry a tune in a bucket," but I thought then, and even now would like to present as a remote possibility, that it meant he envied my vocal command, joshingly indicating that he wished my prowess could be curtailed so as not to expose his own limitations quite so cruelly when he next stepped up to the mike. But I admit it's a bit of a long shot. I also saw the group in the more sedate surroundings of Ronnie Scott's Club (a legendary London jazz venue) some time later and I think that that was it. It had been on mind to record one of the Glasgow concerts with my very basic cassette recorder but I didn't, partly because I assumed there would be recordings very soon, much better than I could manage. I'd even heard them sing Sixteen Candles on the radio, possibly to publicise the residency, so I'd just sit back, enjoy the shows and wait for the LPs. What I hadn't anticipated was that although songs from their live repertoire would gradually be doled out over a series of albums, these would be in the form of polished studio recordings which only hinted at the raw excitement of the same songs live. And as the group - possibly because the great, and much deserved, breakthrough in the West hadn't happened? - went to Japan to develop a career there, recordings were difficult to obtain, although thanks to the magic of a certain auction site I now have several Japanese CDs. What I don't have is the original Catamount LP which I suspect may be nearer to the live group, although their album That`s Doo Wapp Acappela!! which, I think, followed the Catamount LP, has a fair amount of their live numbers but again sounds too clean. If only I had smuggled in my little cassette recorder - especially as there is a noble tradition of lousy-sounding doo wop recordings which are somehow magical at the same time - In the Still of the Night being the most famous case in point. 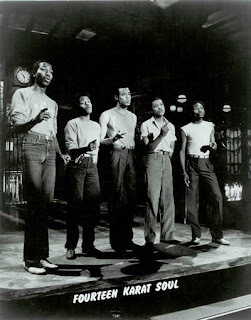 Talking of which, there is a long discussion of that Five Satins recording in the Doo Wop Shop posts (see blog intro for a pdf file link, or wait till I post them in expanded form here). It was particularly enjoyable because lots of people got involved, not just Clarke and me, and one of the questions raised was would you want to listen to some pristine mastertape of that fabled Connecticut church basement recording if it ever surfaced? Opinions differed, but I think the majority felt that the sound quality associated with that recording was now part of the experience. Another point, raised by Bruce Woolf (who very kindly sent me, gratis, tapes of his old radio shows) was that there were only four group members at that basement recording session. To which the only answer could be: we are that Fifth Satin. 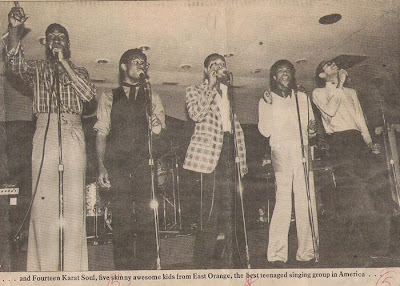 In the same way, by the act of listening to them, and celebrating their memory as best as I can here, I'd like to think that I am that extra member of 14 Karat Soul ... er ... guys? Guys? At any rate, without any available recording by the group which fully captures the pinned-to-the-seat impact of that week in the Mitchell Theatre, Glasgow (if you know differently, please get in touch), all I can do is try to remember what it felt like to be in that audience. And for someone whose exposure to live doowop up till then had been the music hall (vaudeville) version provided by the UK group Showaddywaddy it felt pretty good. I'm still haunted by that singer's gesture. I know, because I was cajoled into singing a kind of Karaoke Abba over Christmas (there, I've said it and I'm glad) that my voice is not, perhaps, the most versatile of instruments (the machine, I think like that new Beatles game, actually rated each note but I don't want to talk about it). Could it have been he was saying: "Yes, your voice is terrible. But it's alright. You're here onstage where you belong, so go ahead and keep murdering the Dell Vikings, what with you being our extra unwanted member, and all"? But maybe it's best - in order to pull some tattered shreds of self esteem around me - to look up from the gesture and fix instead on his grin, which seemed conspiratorial. So it could have meant - oh, I don't know what it could have meant, but whatever was going on, I was part of it, I loved what was going on, and the odds are I didn't actively ruin it. Someone even complimented me at the bus stop afterwards: "That was great, man. Do it again!" But maybe he was tone deaf too. So what does survive of 14 Karat Soul other than my possibly self-serving memories? As mentioned, there's an official website, but as that favours the Japan-era group with personnel changes (founder Glenny T. appears to be the only constant) I'd recommend instead Beaudaddy's 14 Karat Soul page on his Vocal Group Harmony site which has a link to the official site [which, to repeat, is unsafe at the time of this update: August 2010]. The site, which covers many doo wop groups and is well worth a visit, features promotional photos which I have plundered for this article and reviews plus a link to a York Times article about the TV version of Sister Suzie Cinema which was part of the Alive from Off Center series. Scroll down the page to hear three live radio performances including Boogie Woogie Bugle Boy. The audio isn't that great and unless I'm remembering through rose-tinted earlobes the performance here sounds a bit rushed; you can't really hear that graininess I talked about. But I'm very grateful to Beaudaddy for preserving these mementoes. Photographs for this post have been taken from his site. Access Beaudaddy's main page here, with lots of links to vocal groups - click on Persuasions, for example, to be taken to Jerry Lawson's blog. It is possible to find an off-air recording of Sister Suzie Cinema on the net. Alternatively, here is what seems to be a place to rent it legitimately (Electronic Arts Intermix, "a nonprofit resource for video art") and presumably in far better technical quality, but it is not cheap. The larger subsequent production of Oedipus at Colonus, featuring well-known performers from the golden age of gospel, has recently been issued as a DVD and is widely available. There is also a CD of that production. If anyone knows of sheet music, please let me know. Right, I think I'm done for the moment. If anyone has any other 14 Karat Soul memories or information, I'd to hear from you. But to close, a youtube clip which illustrates the circular nature of my doo wop journey as the group do Frankie Lymon. Or, staying with the Lymon theme, if you too yearn to be that extra group member, try this other clip ... though having watched it, you may wish you knew of an internationally understood gesture meaning: "I revere the group you're miming to but, believe me, it would be an enormous boon if you could, er, stop, man? And, most emphatically, don't do it again." Try Them One More Time here. Greece is still the word here. I worked with them on a video shoot of Sister Suzie Cinema at the north end of London's Edgware Road around 1981 or 1982. 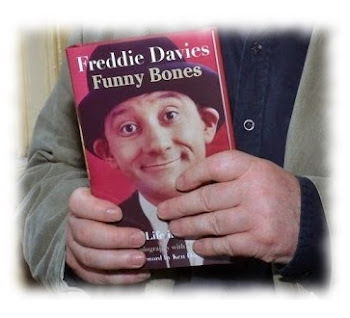 Shot on film, the finished movie was eventually screened on Channel 4 in the UK. I don't remember much about the small independant film company that made the film except the Director was an enigmatic (and rather miserable) German chap by the name of "Schlaker" (sp?). I was only 19 and was basically a 'gofer'. I think I ended up on the credits as one of the 'best boys', and my claim to fame was I operated the hand-winch in the roof of the set to raise and lower the aircraft wing. There were a number of takes and as I recall I lost about 3 stone! 14 Karat Soul were a fantastic bunch of lads to work with. Charming and friendly, nothing was ever too much trouble for them and I remember sharing several pizzas late into the evenings between takes. They have to be the most talented vocal group I ever worked with before or since, and it was a real joy to read your blog and know they did not vanish entirely into obscurity. Thanks for sharing.